Falling liquid films have been the subject of many fundamental research efforts. The complexity of this fluid dynamics problem includes many challenging aspects such as the ultimate goal of predicting heat and mass transfer efficiencies in presence of three-dimensional patterns arising due to one or several instabilities including Kapitza, Rayleigh-Plateau, Rayleigh-Taylor or Marangoni instability, or a combination of those. Due to their wide range of applications, such as in sea water desalinisation, milk or orange juice concentration, sugar production, liquid air distillation, etc., liquid falling films are still currently the subjects of active research. On the fundamental front, a falling liquid film can serve as a canonical system to study spatio-temporal chaos and weak/dissipative turbulence. Indeed, hydrodynamic waves arising at the surface of a falling film exhibit several spatio-temporal transitions from 2D traveling waves to 3D wave patterns, leading to solitary pulses and eventually interfacial turbulence . 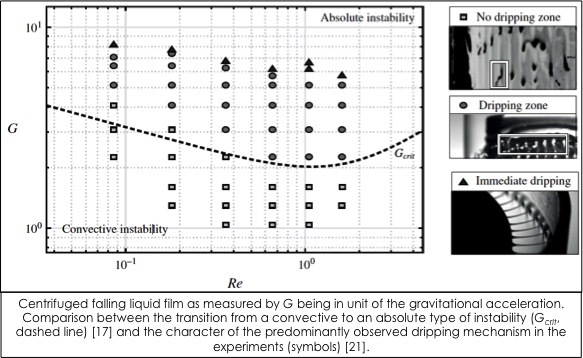 In falling liquid films, the waves are typically long as compared to the film thickness, deformations of the free surface are weak and the viscosity of the fluid ensures a great coherence of the flow across the film. These two peculiarities enable to drastically reduce the complexity of the basic equations and to obtain model systems of reduced dimensionality. Developing such models in various configurations has been one of the main research topics of the PhD. Long-wave asymptotic equation for the evolution of the film thickness is only valid for small flow rate (or Reynolds number), as we have shown  where we systematically analyzed the validity domain of such equation, including thermocapillary (Marangoni) effect. The integral boundary layer approach leads in turn to a system of coupled equations for the film thickness, the flow rate and the interfacial temperature. Though valid for larger flow rates, integral boundary layer equations do not correctly predict the threshold for the primary instability leading to hydrodynamic waves. We have thus applied a weighted residual method leading to a model valid in a wider range of Reynolds number than previous models in literature, and including thermocapillary effect [7,8,11]. Based on the same techniques, we have also extended the model to three-dimensions and have obtained, for isothermal conditions, excellent agreements with various and independent experimental data on 3D secondary hydrodynamic instability and resulting wave patterns [9,14]. For non-isothermal conditions, our theory predicts intricate interactions between hydrodynamic waves and thermocapillary effect , which can lead for specific parameters to the spontaneous channelling of 2D solitary pulses . Such regime is predicted to enhance heat transfer properties and experimental verifications have been recently obtained . Since the thermocapillary effect modifies the wave pattern in falling films, which can affect the heat transfer properties but also generate undesirable dry patches, we also explored the control of deformations by imposing a non-homogeneous heating at the wall [2,4]. 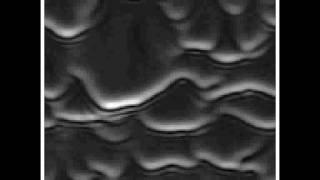 Furthermore, a local temperature gradient imposed at the wall and aligned with the flow can generate a liquid bump as in the “tears of wine” problem, which can become unstable and breaks into rivulet-like pattern [1,3]. We studied this instability experimentally and proposed a mechanism for its onset . Most of our works related to the dynamics of falling liquid films, including wave pattern formation and heat transfer, have been reported in a monograph. The numerical code for simulating falling liquid film is now available in open source . A recent extension of this research topic is to study the coupling between Kapitza waves and Rayleigh-Taylor instability when a film is suspended under an inclined plate [17,18,25]. Such a coupling can lead to intricate 3D rivulet patterns, which might be promising in terms of enhancing heat and mass transfer in industrial processes . It is however of crucial importance to prevent the dripping phenomena, the onset of which has been investigated in a suspended film along a plate  or a curved surface , as well as in centrifuged falling films .